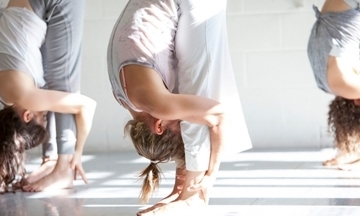 Modern Yoga, founded by Annie Parr and Emily Fromherz Daly is a dynamic mat-less class bridging vinyasa flow yoga, mind-body fitness modalities and floor based modern dance principles. Paced to a playlist ranging from Classical to Alternative the class sequences artful movement patterns to stretch, tone and ground the body. All of the sequences are choreographed and clearly guided similar to a yoga class but with the personality of a dance class. Dancer or not, yogi or not, this is not a traditional dance or yoga class. It is for the athletic and artful minded individual that is looking to creatively expand their practice. This class will open up ones approach to transitions, musicality and flow. Ultimately, Modern Yoga enables a strong, and efficient body, stimulating grace and fun through motion to connect to your authentic self. We begin class with either a standing or sitting moving stretch for the spine and hamstrings to then transition onto the back for deeper muscle release work. Using the principles of the Bartinieff Method which involves X’s and spirals on the floor, contraction and release we build on floor phrase work that is expertly broken down to warm up the core and arms. With breath, placement and grace, we progress into a musically charged standing vinyasa series. We introduce both familiar and unfamiliar yoga patterns, learning the principles of foot pivoting to change direction and to transition in and out of the ground. By layering paced and vigorous sequences, the feeling of a dance emerges. Class resolves in deeper floor stretching and then savasana. This class does not use props and there will be no hands on adjustments. Therefore it requires an intermediate to advanced foundation in yoga and/or dance class experience. Strong chaturanga required.